Gov. Walker has become the first potential 2016 presidential candidate to open an office in Iowa, which will hold its GOP caucuses early next year. Lake Effect's Mitch Teich talks with Politico's Ken Vogel. Two polls out in the past week showed good news for Wisconsin Governor Scott Walker’s possible Presidential run. Gov. Walker said several times, after calling for deep funding cuts in the UW System in exchange for autonomy, that faculty might need to work more. Mitch Teich chats with Chad Oldfather of Marquette University Law School. It’s been a busy week for big announcements by lawmakers. Gov. Walker says he’s giving university leaders what they’ve wanted for years. In a highly anticipated announcement Tuesday, Gov. Walker proposed using a jock tax to help build a new arena for the Milwaukee Bucks. Gov. Scott Walker's campaign revealed to the Washington Post that he has formed an exploratory group - step one toward entering the 2016 race. Wisconsin Gov. Scott Walker met potential supporters in Iowa over the weekend, where he participated in a couple high-profile political events. Gov. 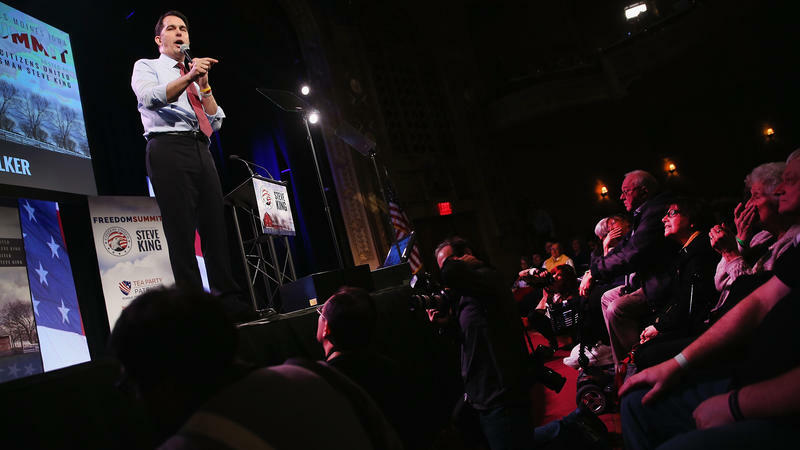 Scott Walker seems to be wading in deeper toward a possible bid for the White House in 2016. Gov. Walker is revealing a few items he will include in his two-year budget for Wisconsin. He will release the full document on Feb. 3. With Walker Gearing Up For a Presidential Bid, How Does He Secure a National Base? Mitch Teich talks with Julia Azari, political science professor at Marquette University. The 2016 Presidential election is still more than 20 months away, but the list of would-be contenders for the major parties’ nominations is growing.